So, after a little hiccup, I'm back with Friday Finds. It's truly been an amazing season so far, and it's only June. 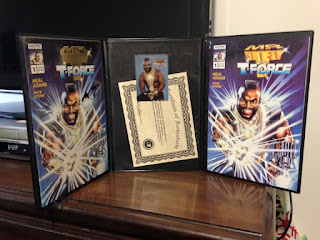 So the backstory: In 1993/1994, Now Comics enlisted Mr. T so he went from badass tv star to full fledged comic book star with Mr. T and the T Force! Comic fans will remember this as T would go around to a comic convention or two and hyped it like only he knows how on tv and radio! 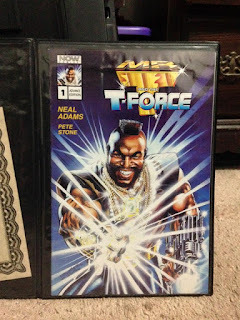 It's a pretty fun comic with cover art by legendary artist, Neal Adams, known for his Batman work, took care of the cover artwork, adding some credibility to the project. Well, the comic didn't last long. 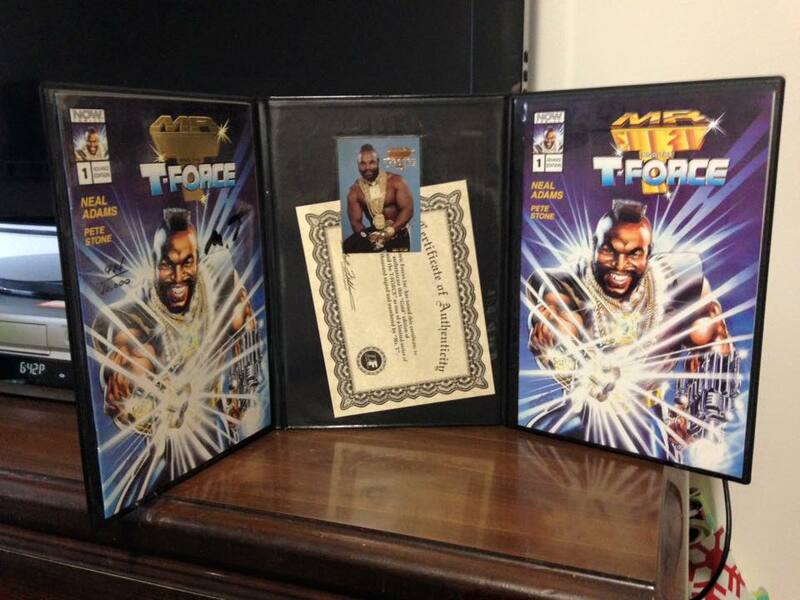 Mr. T wasn't accepted as much and sales weren't that hot. But that didn't stop Dynamic Forces from offering this set. 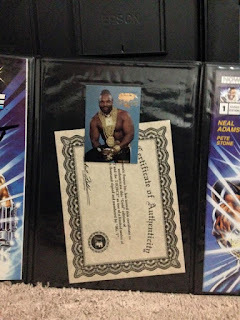 Coming in a trifold binder, you received a gold edition of the first issue signed by the man himself, a trading card, a regular edition of the comic's first issue and a COA. I mean, how cool is this? Mr. T's comic SIGNED by the legend himself?!?!?!? As a lifelong T fanatic, I had to have this. And at TWENTY dollars, I was not crossing the border without it. 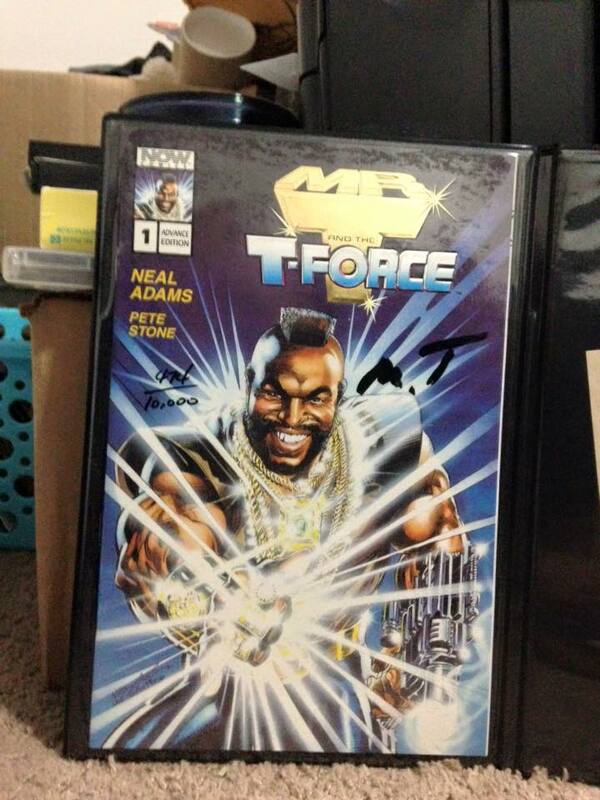 This may be my newest prized possession. It's truly a thing of beauty. From the binder to the comics to the card. Total victory. If I recall, these were offered on Home Shopping Network or QVC or something to that degree. I tend to also remember reading some hype in Wizard as well. It seemed like T was really behind this. It's a shame it went nowhere past a little over 10 issues. But, no matter what, T ALWAYS bounces back!